Many of us whiled away untold hours of our youth mashing the D-pad, A and B buttons of the original Game Boy, which is why we’ve seen many hacks using its iconic hardware. Gaming on mobile touchscreens isn’t nearly so tactilely pleasing as that portable, however, so nostalgic modder Chad Boughton decided to swap out his GB’s dot-matrix display for the Super AMOLED of a Galaxy Nexus. He first removed the screen and trimmed the chassis so that a GNex case could be bolted flush with the rest of the body. The more involved part of the mod, however, was getting the buttons to work wirelessly with the phone. To accomplish the trick, he trimmed the Game Boy’s circuit board to make room for the guts of a Wiimote, which he then connected to the buttons. From there, he installed the Wii Controller IME app to get the GB talking with the phone, and presto! 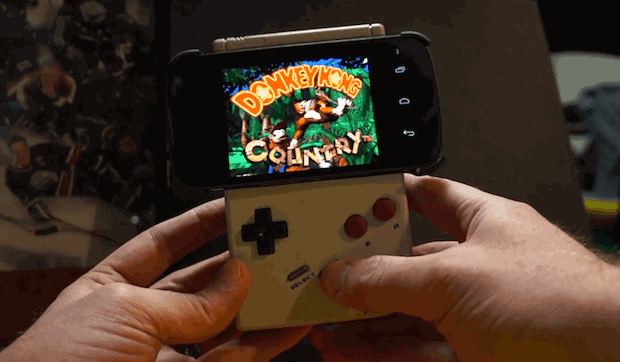 One of the coolest Android gamepads we’ve seen was born. You can see how it works in the video after the break, and there’s a slew of shots showing the mod in progress at the source below. Youtube video demonstration is Here.